Anna's Health Foods Health is your wealth! Hours: Monday-Friday 12.00 – 6.00 p.m. Saturday 12.00 – 5.00 p.m. Closed Sunday. Anna’s Health Foods specializes in organic, chemical free and non GMO food products. There’s no white sugar in any of our products and we sell only the purest plant oils containing Omega 3-6-7 and 9. It’s how we help you to live healthier! Anna has a wide range of health and dietary knowledge but can’t diagnose or prescribe any herbs and/or products. Anna can, however, help you find proper information and direction in which you can help yourself research supplements and herbs that may be helpful in improving your health and live a healthy lifestyle. We ship anywhere in the US. For orders out of town/state call 907-277-2662. Click here for directions to our Anchorage store. We’d like to extend a personal thank you to our Anchorage and out-of-town customers who strive to live healthy and allow us to continue providing a valuable service to the community. Thank you! 2. Doctor of Philosophy from American Holistic College of Nutrition, both located in Birmingham, AL. 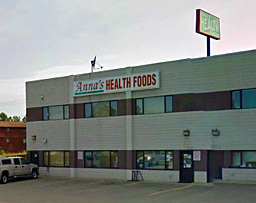 Anna opened her store Anna's Health Foods on Valentine Day in 1994. Anna will be happy to share her extensive knowledge to help you achieve your health goals. When driving through Anchorage on Ingra, Gambell or E 15th Ave, look for our huge signs.